This jazzy online 5 reel is centred around the exploits of a parliament of wise, old owls. The design of this game is very gaudy with many stand out symbols that really catch the eye. This game employs a light-hearted sense of humour that permeates throughout the spinning experience. 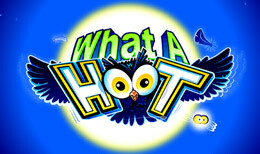 Deposit and Spin today to match 9 paylines of owl creatures and earn yourself some cash prizes. It’s impossible to talk about online gaming without mentioning Microgaming. Founded in 1994, they are one of the oldest online developer companies to date and boast developing one of the first online casinos, the Gaming Club. They also have over 600 games in their library, all up to date with innovative game play and stunning graphics, it’s not hard to see why this developer has stayed at the top of the game. They are trusted and reliable with their game play and pride themselves on keeping your data safe, they also pay out their jackpot wins immediately and in full which is why players love their games. In What a Hoot you will meet all of the owl gang as you spin your way through this funny 5 reels, 3 rows and 9 payline online slot game. In this owl themed game, you get to hang out with some cute 2D owls and get the chance to win some lucky prizes. As you would expect from a Microgaming online slot game, What a Hoot is beautifully designed, the 2D graphics are done to a high level of detail, and the owl characters are full of energy and character. Set in a nocturnal background, the game symbols are colourful and quirky. This game would be perfect for anyone who enjoys a clean fun game and has a good sense of humour. The game play itself is straightforward. You simply have to decide how many paylines you want to play with and then the size of the coin you wish to bet on each line. You can choose between 25p, 50p, £1, £2 and £5 for your coin values. Keeping in with the theme, the reels of this online slot machine revolve around a band of hooting owls who happen to be throwing a party in their forest home. Decorating the reels are symbols such as the white owl with a red party hat, a blue owl with a party horn, a brown owl enjoying a drink, and a yellow owl reading a book. You also have other symbols which form treats for the party owls, you have sunflower seeds, crab apples, a chestnut and an assortment of colourful berries. The most valuable symbol in the game is the ‘What a Hoot’ symbol, land 5 of these and you will be rewarded with a whopping 5, 000 coins! The Wild symbol will substitute for all other symbols bar the Scatter to help you with your winning combinations. The Scatter symbol is a Jar of Fireflies, and you don’t even have to line the symbols up to win! If you see 3, 4 or 5 of these Scatter symbols you will win a multiplier of 2x, 10x, and 50x of your stake!